Despite attempts by the International Olympic Committee (IOC) to ban wrestling from the 2020 Summer Games, the Ashland High School wrestling team remains strong. The IOCs justifications for dropping the sport focus on the lack of “global popularity” surrounding the sport. Although wrestling is not the most popular sport in the Olympics, receiving very minimal televised and press coverage, the love for the sport remains powerful at Ashland High School. As a whole, the Ashland High School wrestling team is fairly successful. One of the strongest aspects is the female portion of the team. While membership remains in the single digits, the girls wrestling team upholds a strong record. During the regular season, Sydney Norvell, senior and first female captain, held up a great record with 15 wins and only 6 losses, going undefeated when wrestling other girls. 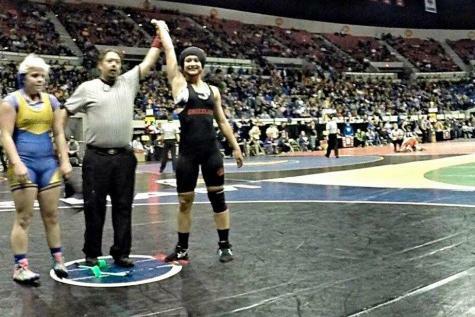 Norvell proceeded to sweep the state title in the Girls 138 weight class at the OSAA State Championships. When asked why she chose wrestling, Norvell responded “I chose wrestling because I have always loved contact sports that involve high demand both physically and mentally, and wrestling definitely met those expectations.” These physical and mental limitations surpassed by Norvell throughout the season are made bearable only with the support of her teammates. “We are all one big family and go through blood sweat and tears together.“ said Norvell.